Giraffes live on only one continent - Africa. These animals are found between Chad in Central Africa and South Africa. Giraffes live in savannas, grasslands, and open woodland. The tall giraffe uses their own elongated neck and tongue to get to the top of African trees. Africa gives the ideal balance of heat, vegetation, and rain to keep the giraffe content for about 25 years. Giraffes live in sub-Saharan Africa, south of the Sahara Desert, from Niger all the way to Zimbabwe and Botswana. The largest concentration is in central eastern Africa. 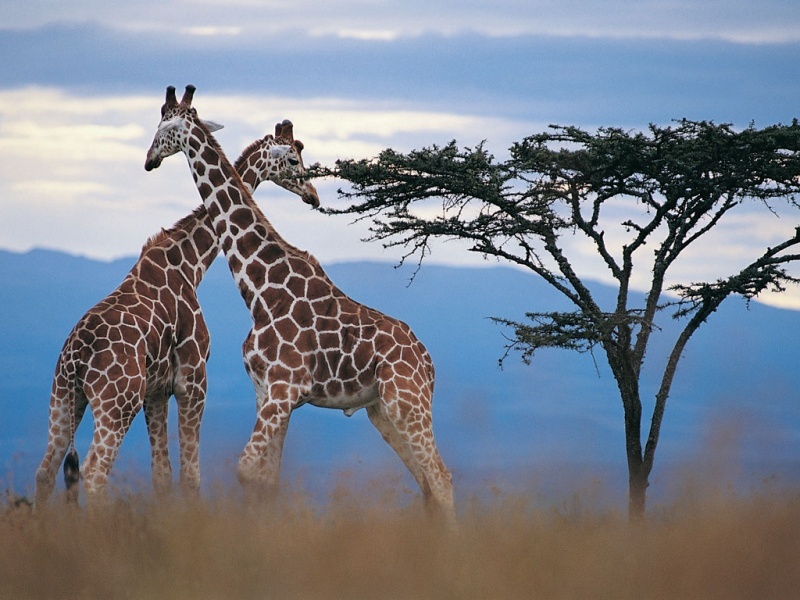 Many wild giraffes populate Kenya and Tanzania. Masai giraffes live in the Serengeti while the Nigerian giraffe is found in Western Africa. Giraffes live in an ecosystem called the savanna. The African savanna is basically composed of rolling grasslands that stay warm throughout the year. Temperatures during the dry season range from about 68 degrees to 78 degrees and during the wet season, temperatures increase to between 78 degrees and 88 degrees. Savannas are mostly found in deserts and the tropical rain forests, which are wet enough to grow a smattering of trees together with the shrubs, but extremely dry for woodlands. The African savanna is just like arid Colorado, at least in dry season. Giraffes can go for long periods without any water, but they still require plant-based nutrition for survival. This makes the African savannas the ideal climate for this animal. Unlike the Sahara, a desert without any rainfall, the African savanna experiences a humid wet season between May and November. The rain allows trees and other plants to grow and give nutrition to the wild giraffe. All giraffes are herbivores. They prefer to feed on tender leaves and some buds but will also eat flowers and other fruits in season. The acacia leaves provide most of the giraffe’s food. In the wet season, giraffes eat deciduous trees, vines, and shrubs. During a dry season, they may eat hearty evergreens next to rivers and streams.